Google is trying to improve their search results, as far as medical diagnosis is concerned. And this has a few people very concerned. Now, when a user searches for a symptom or a group of symptoms, Google’s organic search results will show a list of possible causes for those symptoms. In other words, Google will offer a differential diagnosis for a given set of symptoms. 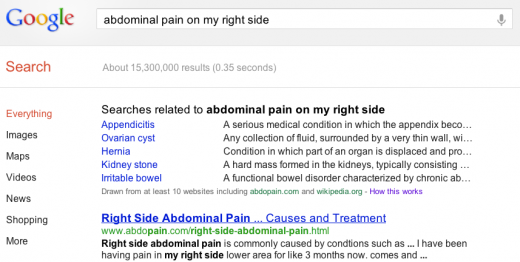 To explain how the system will function, Google has given the example of a search being conducted for right sided abdominal pain, in a blog post. While this is being done with a view to help users, one needs to make sure that the search does not end up causing more confusion. It is very likely that a user conducting a search for some symptoms, may consider the symptom to arise from a relatively minor problem, which may have been placed higher on the search results page. The user may thus neglect taking prompt expert advice, and delay taking treatment and further aggravating a potentially serious illness. On the other hand, some users may consider themselves to be suffering from a major and dangerous illness, and unnecessarily stress themselves over what may eventually turn out to be a minor matter. Google has clarified that the results will be algorithmically presented. The results have not been provided by a medical doctor, who is qualified to make a judgement about the actual diagnosis taking into account several points such as clinical findings and the results of various investigations. While the effort being made by Google is noteworthy, users must remember to use this only as a broad guideline and not as a replacement for an expert opinion. After all ‘little knowledge is dangerous’.